I believe that practicing makes you better. I also don’t want to enumerate all the keys and functions of this software. Boring! Let’s create a song! Anyone can follow this tutorial, even those who never used a tracker before. I actually encourage every user to follow this tutorial, even those already experienced with STarkos and Arkos Tracker 1. I only advise you to first read the page called User Interface Overview just to get a glimpse of the various panels of the UI. Also, note that this tutorials relies on the default keyboard mapping, so if you’ve tweaked it, don’t blame me if the shortcuts shown here are not the same as yours! This is in these tracks that our notes will be written. Move your eyes to the middle left of the screen to the Instrument List. A first default instrument is present: “first”. We will use it to create our first melody. We’ll create our own a bit later. Before laying our notes down, we want to make sure our “small beep” sound can actually be heard. Maybe your sound card is faulty? Or my software buggy? Let’s move your eyes at the bottom to the Test Area. Press F6 to give focus to it. A red rectangle around it shows it has focus. Now start pressing some keys on your (real) keyboard. AZERTY owners will pressed A to Y, QWERTY owners: Q to Y. How fun! A small beep should be heard (if not, consult the File > Setup page). Notice how “right” you go on your keyboard, the frequency increases. You can also use lower notes by pressing W to N for AZERTY owners, Z to N for QWERTY owners. These are the sames notes, one octave below. Want more notes? You can select the base octave either by changing the “octave” at the top of the screen , or by pressing Shift+O to increase it, Control+O to decrease it. After changing the octave, play some notes to hear the change. You can also click on the Piano to emit some notes. Everything is ready to write our first (great) melody. Above the test area is the pattern viewer. This is the main element you will be working with, so don’t hesitate to stretch its size if it is not big enough: go above it till the mouse changes, then click and drag the handle vertically. Give focus to it. Either by clicking inside it, or by pressing F4 (remember this key!). Notice how pressing the QWERTY/AZERTY keys also produce sounds. However, nothing is written yet. What you see is called pattern. It is simply a group of tracks. The tracks are the 0, 1 and 2 that you saw in the linker above. So far, all three are empty. You should see your cursor. Use the up/down keys to change the line where your cursor is. By using Home/End, you can move to the first and last line of your pattern. The last line should be marked “0x3f”, or 63 in decimal. If you look at the linker, you can see that our first (and only) pattern is 64 lines. This matches, because the first line is 0. So 0->63 = 64 lines. We will write our first note. For this to be possible, the Record mode must be on. Either click on the Record button at the top of the screen , or press Ctrl+Space (this combinaison doesn’t work on Mac: use Ctrl+R) . Look at the Record button: it is bright red. Makes sure the octave is 4 (you’ve learned how to check and change it before). Press A (AZERTY) or Q (QWERTY). Yay! Our first note! You should see C-5 01. What does it mean? Simple: “C” is the note, using the English notation (“C” for “do”, “C#” for “do#”, etc. In order: C, C#, D, D#, E, F, F#, G, G#, A, A#, B). “5” means the octave 5 is used. “01” means instrument 1, which is “First”. The other columns are reserved for effects, which we will use only later, so let’s forget about them for now. You have written one note of our masterpiece. Let’s hear it again. But how? Simple: press F9, or click on the icon at the top of the screen. The pattern will scroll automatically, playing the notes as it encounters them. Wait for the whole pattern to loop, and stop the playing by pressing F12, or by clicking on . If at any time you put an unwanted note, move your cursor above it and press Backspace. Read what follows to know of the ways to listen to your notes. There are several ways to listen to your music. The most obvious are the ones described above via the F9/F12. 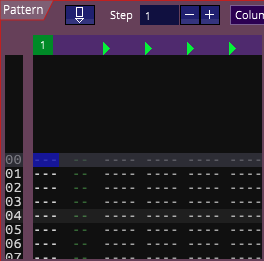 One other way is to press Space in the pattern viewer: this plays the line where your cursor is. 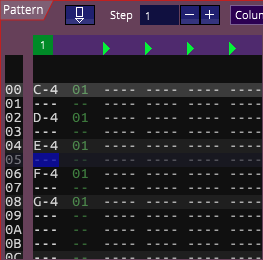 Another handy way to play and edit the song is to press the play song icon (or press F9) like seen before, but then click on at the top of the pattern viewer or press Ctrl + F: your cursor will not follow the what is played anymore: you can thus add notes while the song is played. Added notes won’t be heard anymore till the “play cursor” reaches them. This is great (yes it is! ), but the pattern is too long: it would be nice if the melody could be played without the big blank that comes after it. There are different way on handling this, depending on your music. You can add new notes if you consider your melody should continue. Or you can shrink the pattern. This is what we are going to do. Go back to the pattern viewer, and go to the bottom of the pattern, it is now smaller. Press F9 to play the song: the melody now goes smoothly. You’ve just discovered how to set a height to our pattern. Obviously, every pattern can have a different height, from 1 to 128. Don’t be scared. For more detailed information on the editor, please have a look here. We’ll have a quick overview for now. The lines composing the instrument are read fifty times per second (50hz), by default. When all the lines are read, as the sound doesn’t loop, the sound stops. The first column shows a rectangular wave and a disabled triangle wave. This is the “type” of the line. It means that we are using the square (software) wave, and not the triangle (hardware) wave. This is the most simple sound mode on the AY. Then, we have the volume, set to 15 (0xf), which is the maximum, full volume. In “period”, we can see “auto”. This means that the period of the sound (consider the period as the “height” of the note) is calculated automatically according to the note of either the keyboard, or the music. This is the default mode, and you will most of the time use it. The second line is the same, except the volume is 14. The following lines are the same, with a decreasing volume. You can well understand how all this sounds like. Now we want to hear the sound. How to do that conveniently? You can simply play your song by pressing F9. This works but not always ideal, especially if your sound become lost among all the other sounds of the music. You probably want to listen to it exclusively! You can press Enter to play it, using the note displayed in the Test Area below. This is handy because the instrument editor doesn’t lose focus, so you can continue editing your instrument seamlessly. Press F6 or you go to the Test Area and click on the “note” button on the right. Here, you can use your keyboard to play notes. Notice how the button text changes according to the notes that are played. Press F5 to go back to the instrument editor. A handy option is the “replay” option in the Test Area, at the bottom-right. Select “replay every 1s”. Go back to the instrument editor by pressing F5 and press Enter to listen to it. The sound will be retrigged every second. Heard enough? Press F12 to stop the sound/the music. It shows where the sound ends, and where it loops. You can change this directly by clicking besides any line, over the yellow line. A “S” (start) or “E” (end) appears in overlay. Press F9 to listen to the song, F12 to stop. Isn’t it better (or at least, different)? Let’s have some fun. Just like in the pattern editor, you have a cursor. Click on any “cell” for it to appear. You can then use the cursor to move it. The new sound should have a nice attack with an octave higher (C meaning 12 in decimal, hence on octave). Negative number are also possible. Go inside the looped area and put also an arpeggio to 7, for example line 6. Isn’t it great? Go back to where you put the “7”, and press Ctrl + up/down: this conveniently changes the value of one unit. By using Shift + Ctrl + up/down, the value is increased or decreased by a larger step. Press Space: this copies the selected value to the cell below. Also, feel free to change the Speed at the top of the instrument editor : “0” is the fastest speed, “FF” the slowest. You can change the value either by clicking on the value and typing the number, or via the mouse wheel.